November | 2012 | Simple. I Just Do. The End of November Already? I am so very thankful for the people who come to my site and read my stuff! You all rock! Fine. All four of them. Besides the bloody noses (two of them, one on each leg of the flight down [The Boy, not me. He actually took them pretty much in stride, and thanks to helpful flight attendants, they were quickly handled]), the screaming-coughing-sneezing children behind us, and the parents that were clearly outnumbered (can’t you do math?? ), the seat-backs that were no more than 8 inches away from our face, the waiting, the CRAZY prices they can charge you for snacks at the airport, and the fact that my ears are STILL popping… yeah, completely fine. I’m only half joking. OK, maybe I’m not joking at all. Since when did airline travel become the big, expensive, greyhound of the sky? Back in the day, air travel was exciting, a luxury, and they gave you snacks! 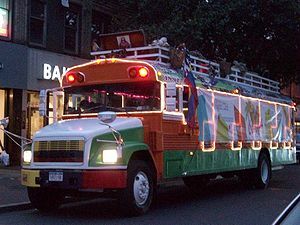 Now, it is the equivalent of the chiva of Central and South America, replete with chickens, noise, and too many people. Oh yeah, and they charge you for the peanuts. And if you want to apply for a credit card, here you go! – we will talk at you about it for about 20 minutes, and make a big production of handing out the applications and then collecting them, while you are desperately trying to tune out the noise and read your book. I don’t mean to be complain-y, but if I am spending $700 on something, I expect it to be at least kind of nice. Nice was not spending four of my vacation days traveling, I’ll give you that. But beyond that, I got nothing. Suffice it to say, I have yet another thing to be thankful for: when I live very near my parents, and with my boyfriend, I will not have to fly/drive as frequently as I do. That’s beautiful. Kids with autism are often lost when one uses colloquialisms and turns of phrase because they don’t jive with the literal translation in their minds. Tonight, I made a comment to The Boy as he was giggling about something he was watching on youtube that he was “laughing like a hyena”. He had no idea what I meant, in large part because he didn’t know what a hyena was. What does a modern mom do? I pulled up youtube and called him over to watch a youtube video of a hyena laughing, in response to which he promptly… you guessed it, started laughing. Does anyone else find this parenting thing not at all as sequential as you thought it would be, and way more random? Small Business Saturday: Are You In?